Examines the amount of practical teaching that universities provide, as a key indicator for assessing the level of professional simulation that those institutions foster. Identifies the journalistic products that students create. Presents the relationships established between academic institutions and media companies (internships, resource sharing, collaborations to broadcast or publish student output to list but a few). Acknowledges the existence of media outlets run by students, universities and faculties in various forms (print, online, TV, radio), and mentions the specific contents that those outlets tend to cover. Delves into the number of academic degrees, both undergraduate and graduate levels, which offer partly or fully integrated courses. When approaching the resulting data and the trends detected, one has to be aware of their volatile nature. Journalism education is changing at an accelerated pace due to the emerging changes in European media organizations. Therefore, curricula are constantly being modified to adapt to those changes and the approach to existing courses (both theoretically and practically-oriented) will be surely redefined. 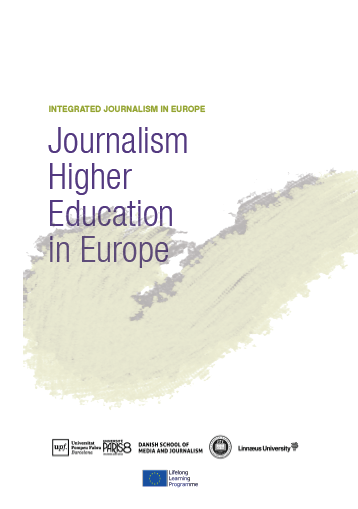 That is the reason why this guidebook aims to be a valuable starting point to continue researching on the situation of the teaching of integrated journalism in Europe.